Click directly on this photo to enlarge the view of the Whitechapel Bell Foundry in London, England, where the Liberty Bell was created, in 1752. 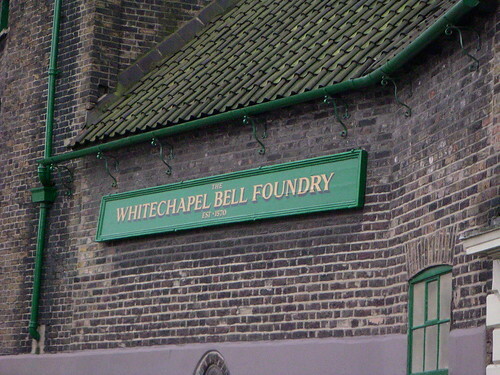 If you look at the sign closely, you'll see that Whitechapel Bell Foundry has been operating since 1570, during the reign of Queen Elizabeth I - and 112 years prior to the founding of Philadelphia, Pennsylvania. During the 19th century, Whitechapel also created Big Ben, for the House of Parliament in London. 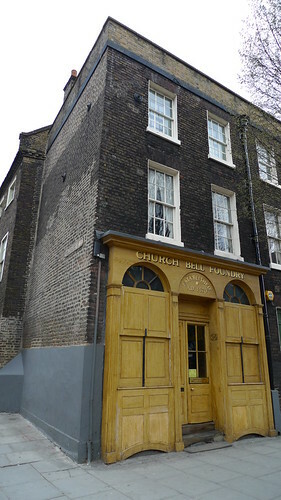 Click directly on this photo, to enlarge the picture of the Whitechapel Bell Foundry, front door. The sign is different, as it reads "Church Bell Foundry", and if you look carefully, over the doorway, you will see "Established 1570". It remains an active bell foundry, to this day. This Liberty Bell History page is still under construction. But there will be a comprehensive history, here, eventually. Please be patient. If you'd like to go to Liberty Bell Facts, please click here. If you'd like to go to the Liberty Bell main page, please click here. If you'd like to leave Liberty Bell History and return to the home page of Enjoying Philadelphia, please click here.